While the rest of us are typing at computers, meeting in the cafe, or giving tours in the galleries, our colleagues on the facilities team–Chief Engineer Huy-Xuan Huynh, Assistant Engineer Hoang Nguyen, and Daily Porter Orlando Ramirez–are hard at work keeping our museum beautiful, functional, and safe. In this post, their boss Dan Datlow, director of facilities and security, describes just one of their projects that may go unnoticed by many, but keeps the Phillips feeling like home. Recently it became clear that the cap stones used around the perimeter of the Hunter Courtyard were showing some unattractive organic staining on the exposed surfaces. The stone is Minnesota yellow Kasota stone which is a rather soft sandstone, so you have to be very careful not to damage it when cleaning. It could easily be cut with the powerful stream from a pressure washer. An application of muriatic acid would definitely remove the staining but there is a considerable risk of damage to the face of the stone and metalwork. I experimented with several common cleaners and cleansers but the results were not overwhelming. 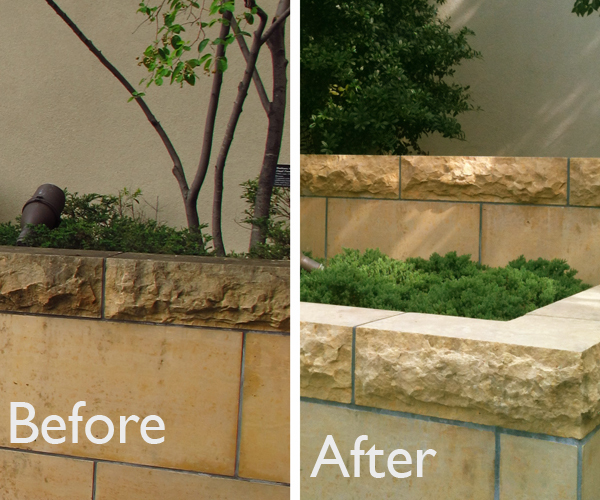 We needed something with cleaning power that contained some kind of biocide that was not strong enough to damage the stone or corrode our metal fixtures. Huy suggested a commercial deck cleaning product. I looked into it and thought it was worth a try. He picked some up, and we loaded it into a pump sprayer and diluted it quite a bit. We applied it to a small, discrete area of the stone and waited ten minutes. Upon rinsing with water, we could see that the stain had receded considerably. It was now a question of how best to proceed: repeated applications or light scrubbing? Hoang and Orlando were called down. It took some time and a lot of elbow grease, but they made their way around the courtyard, scrubbing the walls lightly with small brushes. Huy preceded them applying the solution and then followed up with the rinse cycle. The entire operation took about five hours. The results are impressive, and I think each person involved feels a sense of pride in a job well done. This entry was posted in Experiment Station and tagged Courtyard, facilities, maintenance. Bookmark the permalink. So great! Orlando is such a hard worker and so darn cool! Love this post! Good description — and I agree with what Abby said about Orlando! The courtyard looks beautiful. Congratulations, you guys on a job well done!